We support thousands of people in Newcastle to feel safe and secure at home.� And for a limited time only we�re pleased to offer a free no obligation six week trial to the first 100 customers who book an installation before Christmas. Ostara is ideal for people who live alone or are in poor health or worried about falling. Fleet of response cars and team of response officers based in Newcastle always on hand. For a limited time Ostara is offering new customers a free six week trial with no set-up costs and free cancellation at any time. Contact us now to request a free information pack or book your free no obligation six week trial�quoting SIXFREE. Six week free trial available to 100 new customers only who book an installation on or before 23/12/16. No set-up or cancellation charges for free trial apply. 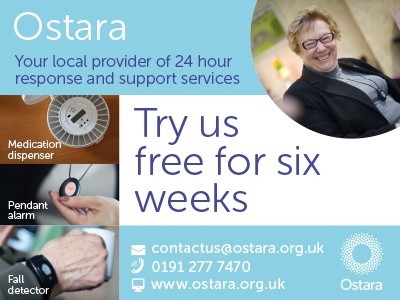 Ostara must be notified within six weeks of installation date to cancel the trial without incurring any charges. Ostara reserves the right to withdraw this offer at any time. Please note: Ostara is only available in Newcastle upon Tyne and some parts of Northumberland and North Tyneside.